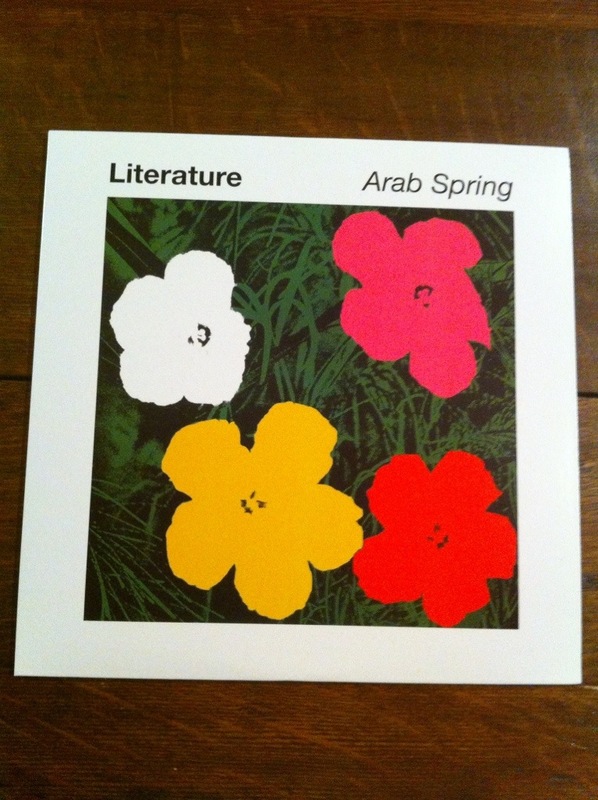 Curious to find out more about one of the most recent Warhol related covers, I was able to track down Literature and ask them a few questions about their “Arab Spring” record cover. WC: How did you come up with the decision for the cover art for your debut record, “Arab Spring”? Nathaniel: Sometime after recording ” Arab Spring” I found myself at the Menil collection in Houston. They had a Warhol room at the time and as I walked in I saw Ten Foot Flowers on the far wall everything about it screamed POP and I knew at that point that I wanted to try to use some amalgamation of the image for the record cover. WC: Did you have any interaction with the estates of Andy Warhol or Patricia Caulfield, the photographer of the original flower image? Kevin: We did not attempt to contact them fearing that it might result in a legal obstruction that would push back the release of the record or disallow us from using the cover. WC: Was the image used an original Warhol image, or was it manipulated to avoid copyright issues? Kevin: The artist Jordan Shade and I worked to create a new cover using the same techniques employed in the original series. I think that the flowers’ shapes might be cut from the original series but they were overlaid onto a new screen of grass and colored by us. WC: Does the work of Andy Warhol have any special meaning to any of you in the band? Kevin: Nathaniel and I have an abiding fondness for NYC Culture running from the late 60’s to the mid-80’s. That period is obviously indebted to Andy. That we are influenced by bands he showed a great enthusiasm for might be why we felt his work was a great visual complement to our music. Thanks to Literature for taking the time to answer these questions. Please help support Literature by visiting their links below. The last link allows you to buy their reissue in white, pink, gold, red, black or all 5 like I did. LITERATURE … album available + new 7″ single! Arab Spring, the debut album from Philadelphia-transplants Literature has recently been re-released. The band’s debut showcases a taut, novel sound; an assemblage of power-pop and jangling guitars that’ll prompt you to dance in your garage. They’ve previously been featured on Matador Records co-founder Gerard Cosloy’s Casual Victim Pile II Compilation, performed on Terre T’s “Cherry Blossom Clinic” and recorded with Greg Ashley (of the Gris Gris). Now they’re ready for their moment in the sun with this, another assemblage of paens in the key of pop. The release of Arab Spring, a joint venture by Square of Opposition and Austin Town Hall Records, is about to re-pressed and remastered (100 white vinyl, 400 black) as well as being released on CD in Japan on Waterslide Records. In fact, it’s a “must-listen CD” at Tower Records listening stations country-wide. The group is scheduled to play NYC Popfest with Close Lobsters, The School, The Bats, and a host of other jangle-pop legends. They are also going to tour the UK in October 2013. “Arab Spring” album art can be found here ! Arab Spring/Tye-Dye preorders can be made here. Many thanks for doing this interview Frank. Very interesting. Frank, this is important information for collectors of Andy Warhol’s record cover art. Thanks for taking the time and going the extra mile to get this information.